Supro has announced its latest blue rhino hide tolex’d combo to join its ever-growing line-up, the 1685RT Neptune Reverb guitar amp. 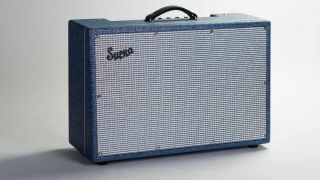 The 25W 2x12 amp was developed in partnership with USA backline rental co SIR, and designed to be Supro’s response to the Fender Twin and Vox AC30. 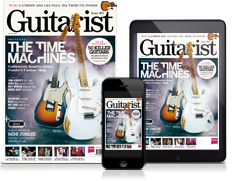 A Class A power section promises mic-friendly midrange and plenty of front-end headroom, tweaked by treble and bass controls. Onboard effects include a four-spring 17” long reverb tank with all-tube drive, as well as a tremolo circuit, positioned in the output section. Elsewhere, the amp features four 12AX7 preamp tubes, and two BD12 Black Magick speakers. The 1685RT Neptune Reverb is available now for $1,499 (approx £1,200) exclusively from Reverb.